Srila Prabhupada chose to rest on the balcony rather than his room because of the heat. From 11:15 P.M. until 12:10 A.M. he took his massage, and then he rose around 2:00 A.M. Then, between 3:00 A.M. and 4:30 A.M. he summoned me with his buzzer five times because his dictaphone kept malfunctioning. There was some connection which kept shaking loose and I had to repeatedly jump in and out of my sleeping bag, running to and fro between the rooms to fix the problem. I was just nodding off to sleep when I heard the bell a sixth time. Again I leapt out of my nylon sack, shaking off the stupor of impending sleep, ran the short distance down the veranda, opened the door to Prabhupada's room and offered my obeisances. I looked up to see Srila Prabhupada working steadily at his desk, the dictaphone clicking away in his hand, functioning as it should. He peered at me inquisitively over the top of his reading glasses, as if I were interrupting his thoughts. "I thought I heard the bell ring," I said sheepishly. 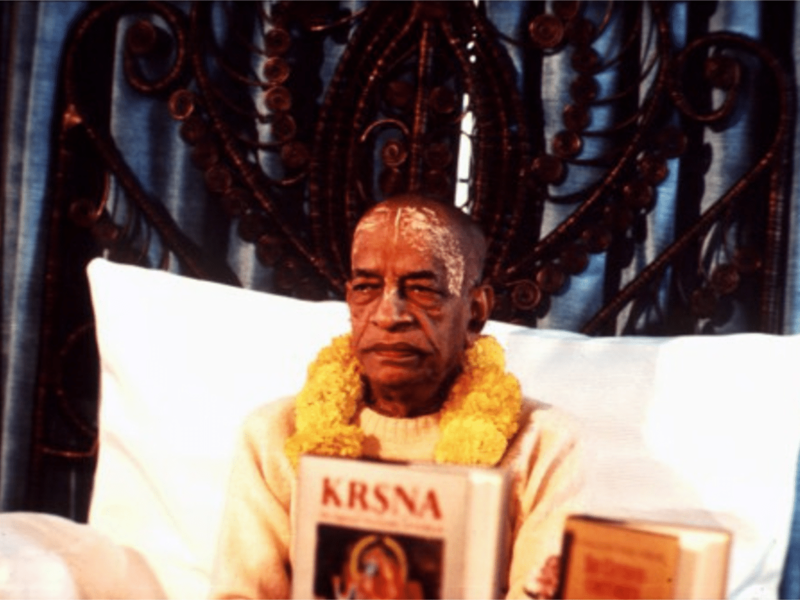 Without a word or change in expression Prabhupada simply shook his head, looked back down at his books and went on with his translations. I returned to my sleeping bag, realizing that the sixth ring had been naught but a dream. August 8th, 1976 Prabhupada went for his walk as usual at 6:00 A.M. but allowed me to stay back and catch up on my rest. The devotees took him out to nearby Niavaran park, situated next to a palace of the same name, which the Shah of Iran uses for receiving visiting diplomats and heads of state. It is the same place he walked last year when he visited with his servant Sruta Kirti and secretary Paramahamsa Swami. Before they left I handed the recorder over to Pradyumna with instructions how to use it so that no valuable comments Prabhupada might make would be lost. Srila Prabhupada didn't disappoint the devotees, who were all eager to hear whatever he had to say. He talked freely, pointing out the foolishness of trying to maintain the body as the goal of life, and the futility of materialistic family life. He explained how modern religions are meant for the envious. "That is material world, envious. That is a disease, to become envious. The spiritual world means no enviousness. That is spiritual world. And material world, there is only envious. I'm envious of you, you are envious of me. It is a society of enviousness. Dharmah projjhita-kaitavo 'tra paramo nirmatsaranam. Paramo nirmatsara. One who is not at all envious, for him, bhagavata-dharma. This other dharma is for the envious person." Navayauvana expressed a little surprise that dharma could be for the envious. "Yes, so-called dharmas," Srila Prabhupada told him. "Just like we have created so many dharma: Hindu dharma, Muslim dharma, Christian dharma. They are so-called, they are not dharmas. Dharmam tu sakshad bhagavat-pranitam. Dharma means what is given to you by the Supreme Lord, that is dharma. Otherwise, if you manufacture some ritualistic ceremonies, some formulas, some dogmas, that is cheating. That is not religion. Sa vai pumsam paro dharmo, that is first-class religion. What is that? Yato bhaktir adhokshaje. Where from you learn how to love God? If you learn, 'I believe this, I believe that; this is our ritualistic ceremony,' these are all cheating. As people are cheating one another in different ways, this is another cheating. That's all. They will say, 'We believe in this way. We believe in that way.' So what is that, you believe in that way? What is the fact? If you believe something wrong, is that to be taken as religion? We say tatha dehantara-praptir. Other religious sects, they say this is Hindu belief. When Krishna says dehino 'smin yatha dehe kaumaram yauvanam jara: just like the child is becoming boy, boy is becoming young man. This is science. And why do you say it is Hindu belief? Does it mean that a Muslim or Christian child does not become a boy? What do you mean by Hindu belief? But they say it like that, Hindu belief. Is that correct if somebody says it is Hindu belief? No, it is fact, it is science. What do you think? Is that Hindu belief?" "No, it's just like you said, Srila Prabhupada," Dayananda said. "It's given by the Supreme Lord." But Prabhupada was more down to earth. "Apart from Supreme Lord, it is a law of nature. Prakriteh kriyamanani, the law, nature's law is acting like that. How you can avoid the laws of nature? If some young man says, 'No, no, I'll not become old man,' will the law of nature excuse him because you do not like? You have to become old man. The law of nature is working so strongly, but this rascal is proud of his own belief. This is foolishness, mudha." The devotees were fully enlivened from their close and personal association with His Divine Grace. Preaching in such an isolated country with little contact with the rest of the worldwide devotional community has its compensations. In such circumstances, when Prabhupada comes, everyone gets the opportunity to speak with him and share some informal and intimate moments.